Brigg lives in a small, grey room in a large, grey city. When he finds a book in the library labelled ‘Do Not Read’, he cannot resist taking it home. In it, he comes upon pictures of bright, vibrant objects called flowers. He cannot find flowers anywhere in the city, but stumbles instead on a packet of seeds. This sets off a chain of events which bring about unexpected results, continuing to grow and bloom even after we have turned the last page. 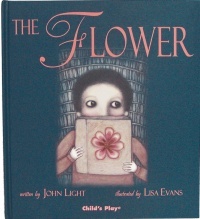 John Light’s enigmatic story is told with utter simplicity, but resonates long after we finish reading this book. His increasingly optimistic vision is hauntingly captured by Lisa Evans’s beautiful and whimsical illustrations. When Max the dog steals an egg from his best friend Beryl, it leads to a midnight visit from the mysterious Doglins. Only when Max stands up to their bullying does he come to realise what he has to do to put things right.